KCC PRODUCTIONS PRESENTS “NOCHE LATINA”, A NIGHT OF SALSA AT MAI TARDI RESTAURANT WITH ZARABANDA BAND. KCC Productions continues their “Noche Latina” series with Zarabanda Band at Mai Tardi restaurant’s outdoor courtyard in the Design District on Thursday, September 16, from 9 to midnight. Party under the stars to some of the best salsa while enjoying a mojito with reasonably-priced Italian cuisine as well as tapas, all without a cover charge! Zarabanda Band emerged in the late ’90s. They were originally contracted as the house band for the Zarabanda restaurant owned by renowned Cuban singer Willy Chirino. They were first known as “Banda del Callejon”, shortly after they began their engagement at the restaurant the band adopted Zarabanda as their performing name. Within a few months proprietor Willy Chirino was so impressed with how tight the band sounded that he asked them to be his official backing band. Zarabanda traveled with Chirino for a period of 5 years, performing both nationally and internationally. Since 2004 Zarabanda, under the direction of bassist/arranger Lalo Vazquez, has been in high demand in south Florida among the salsa and Latin music audience. They have performed for audiences in New York city, Atlanta, Los Angeles, Cancún, Panama city, the Canary Islands, and Spain just to name a few. When not on the road they can be heard at the infamous “Bongos” club owned by Emilio and Gloria Estefan, located adjacent to the American Airlines arena, home of the Miami Heat basketball team. Zarabanda has just released their very first and highly anticipated live recording, now available to the public. For more information about Mai Tardi, visit their web site at www.maitardimiami.com, or call 305-572-1400. 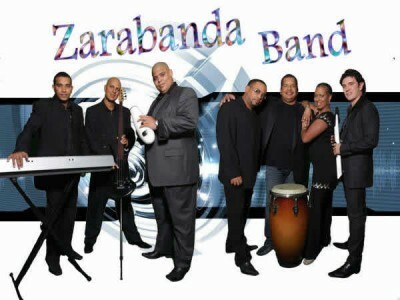 For more information about Zarabanda Band, please contact Kimberly Chmura at (305) 332-2623 or visitwww.kccproductions.com. KCC Productions specializes in providing clients with highly talented, quality jazz artists for concerts, private parties, corporate and special events, festivals, trade shows and fund-raisers. After partnering with highly respected music professional Rafael Solano in 2009, KCC Productions has been bringing the Jazz culture back into Miami with an array of artists.